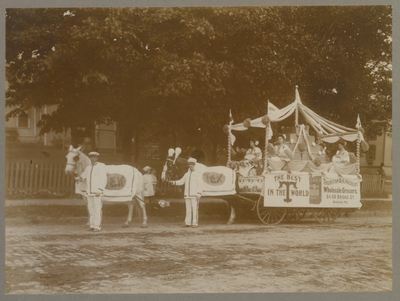 "Thurston & Kingsbury Wholesale Grocers Bangor Carnival Parade Float, J"
"One of the very attractive floats was the T. & K. float of Thurston & Kingsbury, with its pyramid of ten chests, each with the symbolic initials of the firm and with four young women riding, one in each corner. The prevailing colors were yellow and white and the horses were driven tandem." Roscoe A. Kingsbury and Willis L. Thurston were the proprietors of the company, a wholesale grocer located at 64 Broad Street.